In Montclair, New Jersey, a neighborhood has come together to help make their community a safe and vibrant place. 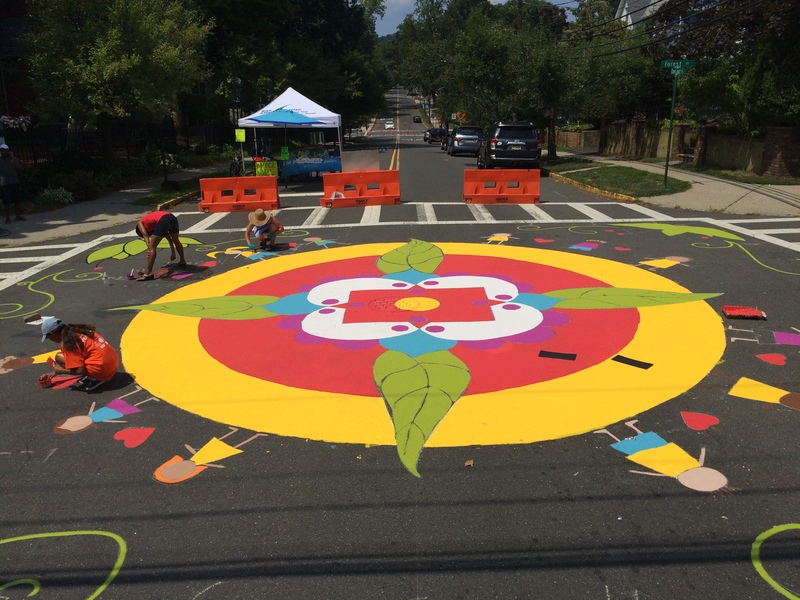 In 2015, a group of concerned parents, kids, local businesses, and institutions executed the first iteration of a Lighter, Quicker, Cheaper Placemaking project - called the Montclair Community Street Quilt - which is made up of a “patchwork” of painted intersections throughout the community. The idea for the project emerged from local concerns about traffic speeds at the intersection of Forest and Chestnut Street. Because the intersection is adjacent to a K - 8 school and only a block away from a middle and high school as well as a community recreation center, it is frequently crowded with pedestrians, cyclists, students, and, unfortunately, fast cars. Because of concerns over automobile speeds, the neighboring K-8 school petitioned the Township to conduct a study of the site. After acknowledging the troublesome traffic conditions, the Township agreed to install a four way stop at the intersection. A good first step, but the community wanted more. One zealous nut in particular, Haley Winstead, a high school freshman looking to earn her Girl Scout Silver Award, began working with local organizations like Bike&Walk Montclair and Eat.Play.Live...Better, along with the Township, to expand this traffic safety project into a broader placemaking initiative. Inspired by The Intersection Project in Portland, OR, they planned to paint a mural onto the intersection which would reduce driving speed and bring people together in creating a beautiful new neighborhood asset. The idea for The Montclair Community Street Quilt project quickly gained traction, and when the day arrived to paint the mural, the project had nearly 100 volunteers and all the necessary supplies, artists, food, and police presence had been acquired through donations or grants. 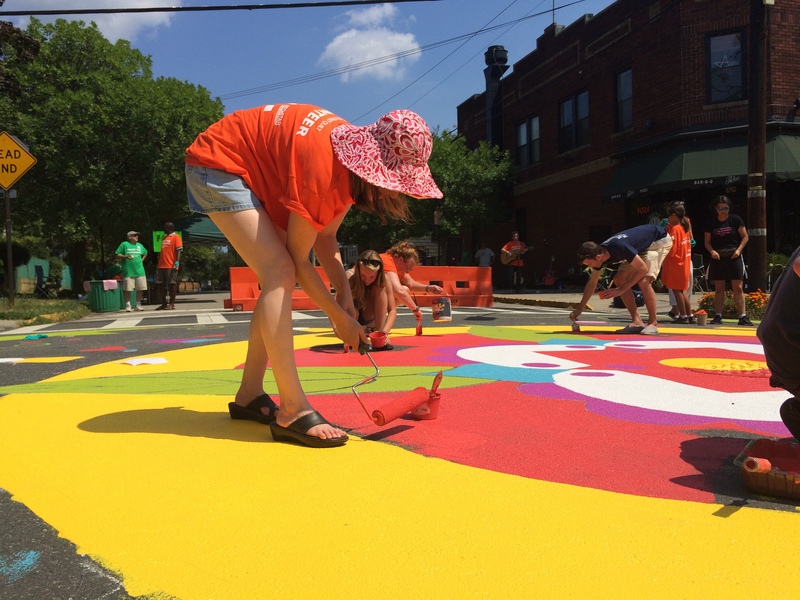 As painting began on a warm day in August, community members also shared food and enjoyed live music, while celebrating their street as a place for people and not speeding cars. Since then, the mural’s impact has gone well beyond traffic calming. It has fostered a sense of ownership and camaraderie within the community, and it has also helped generate momentum to develop similar projects across Montclair. 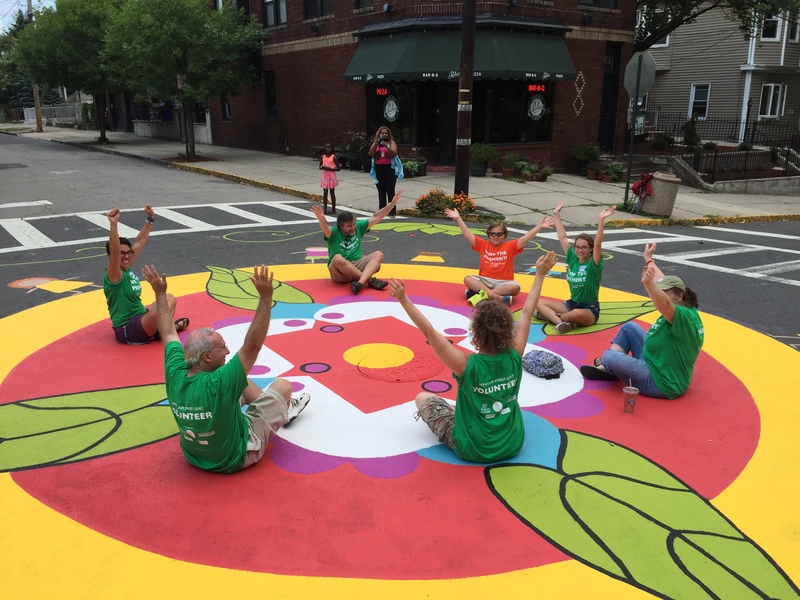 Since the initiative, organizers have been working to incorporate the idea into the official Traffic Calming Procedures and they have slated ten new sites to receive similar community-led murals like the one at Forest and Chestnut. While the project was initiated to improve street safety, the goal was also to bring people together. The mural was a catalyst for a collaborative, social experience that helped strengthen community bonds. Improving pedestrian and cyclist safety is not an anti-car agenda. Transforming an intersection into a place is about including the needs of everyone, be it pedestrians or drivers. In fact, PPS employee Nidhi Gulati recalls that right after the orange cones were removed from the street, a car rolled through the intersection and slowed down - the driver marveling at the art work. The car was followed by a couple of kids on bikes doing the same. The mural is something to be enjoyed by everyone. Lighter, Quicker, Cheaper placemaking does not need to be guerilla. In Montclair, partnerships between local government, nonprofits, and community members were key to the project’s success. The Township played an important role, creating a four-way stop and supplying the permit for the painting day. These were important ingredients in the success of the project. 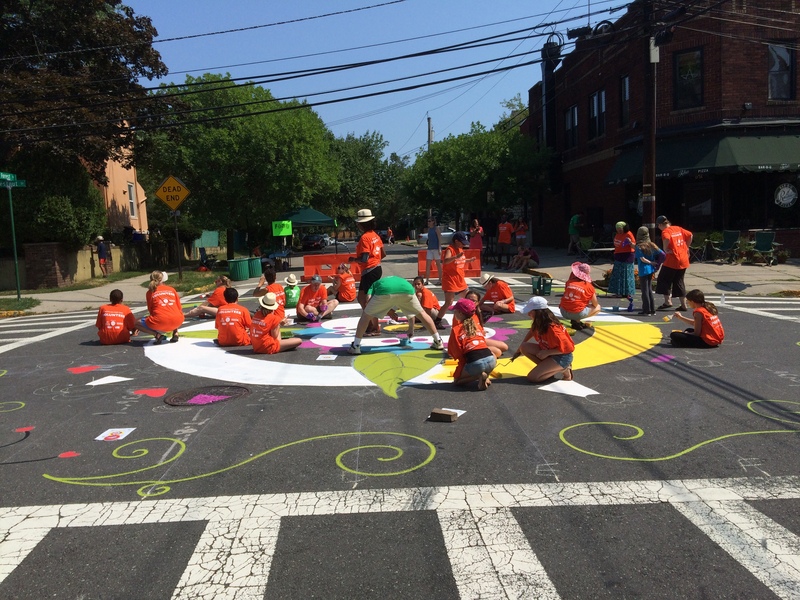 The continued partnership between government and organizers is helping expand the quilt throughout Montclair and adopt its principles into official Traffic Calming policy. Small and incremental steps with even smaller budgets can be very impactful. In Monclair, a simple mural proved to be a dollar-conscious but extremely effective Placemaking tool. More expensive or time consuming interventions may be needed at some point, but the mural has made a strong case for it. Moreover, the organizer’s success in engaging a variety of nonprofits, businesses and residents into the project through funding and donations allowed them to develop it without any capital at all. Speaking of cheap, a fancier intervention does not guarantee more success. Montclair’s bright, beautiful mural was born out of community interest and talent. In fact, organizers are thankful that the intervention is not expensive or permanent because it allows them to organize everyone next year to repaint the mural, fostering community ties once more. Colors beat monochrome in effectiveness. Bright colors are a powerful way to get cars to slow down and take notice, thus making the street safer for pedestrians and cyclists. Color also adds vibrancy and personality to a neighborhood, and provides the opportunity for pooling leftover resources. Placemaking is an all-ages endeavor! Haley Winstead, a highschool freshman, spearheaded the Montclair Community Quilt. No one is too young or too old to spark change in their neighborhood. Placemaking is an inclusive project where everyone is encouraged to take part. The only materials this project required were tables, tents, food, trash bins, paint, painting supplies and movable barriers/cones to cordon off the intersection. All of the materials were delivered on the morning of the event and removed that afternoon. Organizers worked with the Township to secure a block party/parade permit in order to have full access to the space. The entire project, from inception to implementation, took just four months. Soon after the idea was proposed in May 2015, the newly-formed project team got to work and began meeting with key stakeholders. The initiative officially launched in June, which included a design contest open to the public. Submissions were due that same month. Organizers spread awareness about the project through social media outlets, and brought on volunteers during the July 4th Picnic. 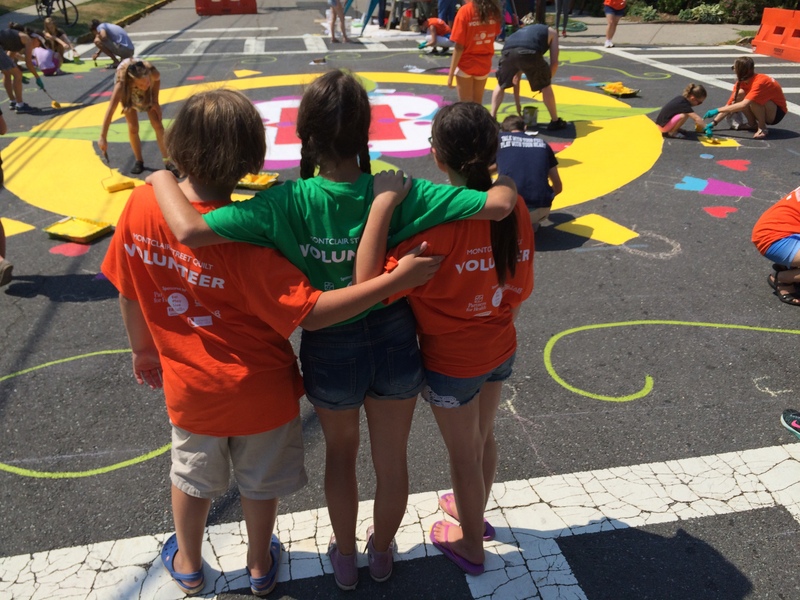 After choosing the winning design and securing supplies and sponsors, the intersection was painted in August 2015! The project was completely funded by volunteers and good will. Everything needed for the project, from supplies to expertise and labor, was donated or grant-funded. For example, paint and paint supplies were donated by a local paint shop, a nearby businesses contributed electric and water, a local band played music, and non profits supplied funds and volunteers. Organizers of Montclair Community Street Quilt estimate that the true cost was between $1,000 and $10,000. The mural continues to be an important neighborhood anchor, slowing down cars and providing residents with a safer place to walk, cycle, or admire the work of their community. Over time, as the mural begins to fade from sun and use, Haley and others see this as a perfect opportunity to bring everyone together again to repaint the mural and create a tradition around co-creation. With each quilt “square,” Montclair’s Placemaking movement will continue to grow.